In Slovenia, passenger car transport is increasing and public transport is decreasing. The increase in car ownership can be attributed to ideas about greater flexibility, improved mobility and low quality of public passenger transport. The share of Slovenian households owning a personal car increased to 80% in 2007 and the number of passengers using urban public transport dropped by nearly 50% compared to 1990. The data for Central Slovenia and the Podravje statistical regions show that more than 70% of the population travel to work by car. Passenger cars cause the highest degree of pollution and minimum energy efficiency, especially in urban areas. The indicator shows the share of households with one, more than one or with no cars in the years 1996 and 2002, the trends in the share of households owning a passenger car since 2000, and the modes of transport to work for two statistical regions. 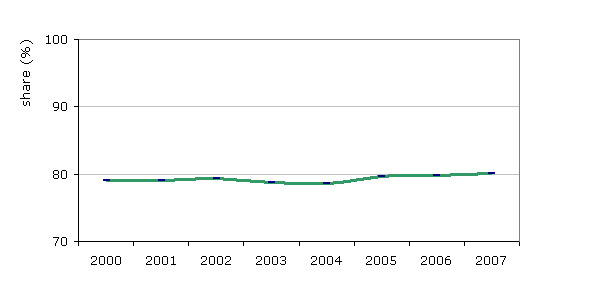 Statistical Office of the Republic of Slovenia, SI-STAT Data Portal, per five years. Statistical Office of the Republic of Slovenia, Urban Audit Project, 2009. • In purchasing road transport vehicles, the contracting authorities, contracting entities and some operators must take into account the energy and environmental impacts of vehicles over their lifetime, including energy consumption, CO2 emissions and other pollutants, in order to promote clean and energy-efficient vehicles and improve the contribution of the transport sector to environmental, climate and energy policies of the Community. The use of passenger cars results in numerous environmental impacts, such as land use changes for the construction of road infrastructure, exhaust and noise pollution, and generation of waste. We must also bear in mind the impact and frequency of road accidents. From 1995 up to and including 2006, 3,700 people died in road accidents in Slovenia. In 2007, transport in Slovenia contributed around a quarter of the total of the country’s greenhouse gas emissions, 99% of which resulted from road traffic. Traffic is also one of the main sources of emissions of acidifying substances (NOx, NH3 and SO2), ozone precursors (CO, NMVOC and NOx) and particulates (PM10 and PM2.5). In addition, end-of-life vehicles also present a major problem, as they generate hazardous waste. In 2008, nearly 7,000 end-of-life vehicles were dismantled in Slovenia. Car ownership is increasing in our country. In 2006, almost one million passenger cars were registered in Slovenia. According to the data provided by the Statistical Office of the Republic of Slovenia, around 80% of all households owned a passenger car between 2002 and 2007. In 2002, nearly 30% of households owned two or more cars. In 2008, the share of public transport decreased by nearly half compared to 2000. The data for Central Slovenia and the Podravje statistical regions has shown that more than 70% of people drive their cars to work, and only around 12% ride a bicycle, which is similar to the share of those who take the bus. Just over 1% of the population take the train to work. 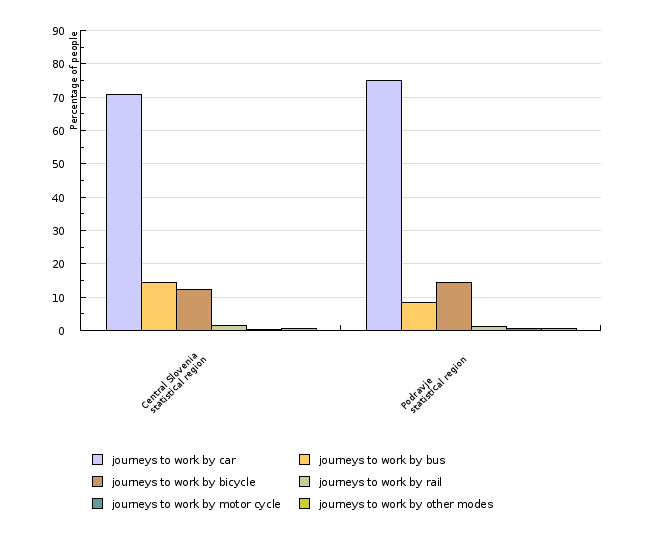 On average, people travel 20 minutes to work. A survey carried out by the Faculty of Social Sciences has shown that inhabitants of Slovenia are aware of the environmental consequences of increasing traffic. A great majority of persons interviewed believed that improved public transport in urban areas would contribute to the solving of environmental issues. Otherwise, 61% of those interviewed use passenger cars for their daily needs, but 80% of these drivers would be willing to use public transport if it was organised in a proper manner. In 2008, Slovenian roads witnessed almost 9,000 road accidents and 214 deaths. The Operational Programme of Environmental and Transport Infrastructure Development for the Period 2007–2013 specifies some solutions for improving road safety, namely by means of accelerated construction of the motorway network, bypasses and non-level crossings, by improving the vehicle fleet, by educating drivers and by stricter monitoring of traffic violations. The Resolution on the National Programme of Road traffic Safety for the Period 2007–2011 will also contribute to a higher level of safety; the motto of this resolution is “No casualties on Slovenian roads”. Construction of the Smednik–Krška vas and Vrba–Peračica motorway sections has been approved within the framework of the Cohesion Fund. Similar to Slovenia, car ownership is increasing in other European countries as well. The EEA Report 'Time for action – towards sustainable consumption and production in Europe' indicates that in 2004, the number of registered passenger cars in the EU-25 reached 216 million. Since 1990, the total number of cars increased by 38%. The largest increase of registered passenger cars was recorded in Lithuania, Latvia, Portugal, Poland and Greece. Three-quarters of journeys travelled in the EU-25 are made by cars, while 80% of the world population has no access to motor vehicles yet. Allocation of European structural funds proves the fact that priority is given to the development of the road network. Thus, 64% of EU structural funds were spent on road construction and only 5% on railways between 2000 and 2006. . The EEA Report 'Europe's Environment – The fourth assessment' refers to a recent Dutch survey that showed perceptions of cars among the public to be better than public transport in all aspects except safety. The negative perception of more sustainable transport can be reversed through integrated spatial planning and investment in infrastructure, combined with market-based instruments to reduce the attractiveness of cars. This has been demonstrated in model cities such as Strasbourg and Copenhagen, where car ownership remains low and the use of more sustainable transport modes, such as bicycles or public transport, is high. The increase in car ownership is mainly attributed to ideas about greater comfort and improved mobility. However, in considering means of transport per passenger, passenger cars provide the highest degree of pollution and minimum energy efficiency, especially in urban areas. Objectives summarized by: Resolution on Transport Policy of the Republic of Slovenia, 2006; Operational Programme of Environmental and Transport Infrastructure Development for the Period 2007-2013; and Directive 2009/33/EC on the promotion of clean and energy-efficient road transport vehicles, which must be integrated into the national legislation by 4 December 2010. 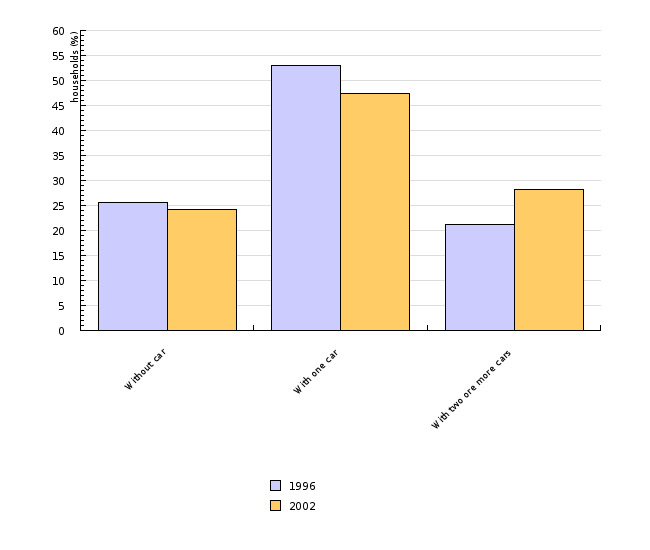 Source database or source: SI-STAT Data Portal (General Indicators – per five years, and Share of households with certain consumer durables – annually (Demography and Social Statistics; Household Budget Survey)); Statistical Office of the Republic of Slovenia, Urban Audit Project for the years 1991, 1996 and 2002. Methodology and frequency of data collection for the indicator: The data on household car ownership is derived from the SI-STAT Data Portal of the Statistical Office of the Republic of Slovenia; General Indicators Dataset – per five years; and from the Chapter 'Share of households with certain consumer durables, Slovenia, annually'. The data on the modes of transport to work is derived from the SORS Urban Audit Project, collected for the years 1991, 1996, 2002. More information on the Urban Audit Project: http://www.urbanaudit.org. Data processing methodology: Data on the modes of transport to work is presented only for two Slovenian regions and was collected by the SORS.